Moving into a 32-ft RV means minimalism (simplifying) whether you want to or not. There’s room only for the essentials and not much else. 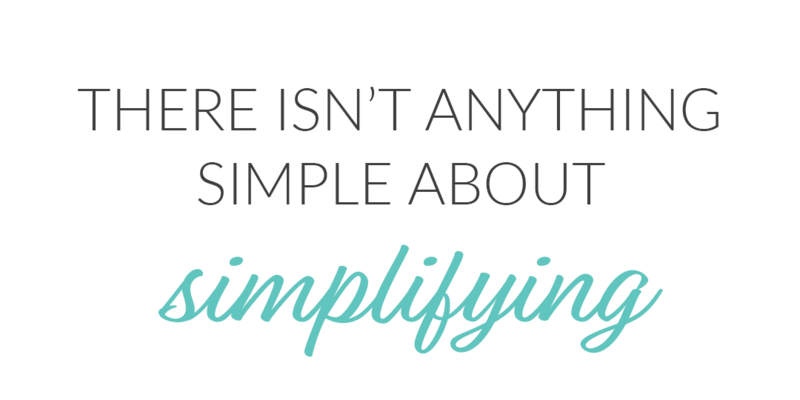 And let me tell you, there isn’t anything simple about simplifying. After living comfortably in 1700 square feet for the past four years, we’ve collected plenty of non-essentials, not to mention I’m a bit of a hoarder. Scraps of fabric that I’ll one day use, airplane tickets from our honeymoon, Hudson’s puppy collar… lots of things that represent memories but ultimately resulted in clutter. Preparing to move into the RV full-time meant a lot of sorting and cleaning out. This purge wasn’t anything like cleaning out your closet after Christmas to make room for new clothes. It was cut-throat closet, kitchen, spare bedroom, drawer-I-never-open cleaning. Round one: throw away the old, broken, unusable, yes even several of the memory “things” that we didn’t need to keep. The hard part was next. What do we want to take in the RV? What do we want to put in storage? And what can be sold or donated? We literally walked through the house, room-by-room, with a notebook and made a list of what we needed to take on the RV and what we really wanted to take. Essentials – can opener, French press, important documents, etc. Really want but not essential – cocktail set, extra coffee mugs, throw pillows. 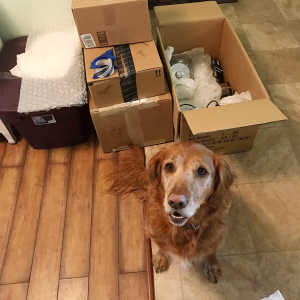 As we continued to clean out the house, this was our guide to make sure we didn’t try to bring too much onto the RV and to make sure we didn’t store or give away something we needed. The easiest next step for me was to go through our closet. Since we have about three RV-size cabinets a piece for all our clothes and all four seasons to be prepared for, I basically made the most skimmed down capsule wardrobe possible with the addition of extra yoga pants and hiking clothes. The nicer clothes I no longer needed I sold on Poshmark. Everything else went to the yard sale or give away pile. Moving is a good excuse to purge, but moving into 270 square feet that doesn’t need to be and can’t be furnished calls for a yard sale. We stored our good furniture and favorite décor, but pretty much everything else went to the yard sale. It’s amazing how much stuff I crammed into some of our closets only to be sorted years later for the yard sale. We didn’t make a ton of money during the yard sale, but it was better than nothing. We did clear out a good amount of stuff, which mean fewer trips to the Salvation Army – totally worth it! It took months of sorting, deciding and finally purging to get us to a place of minimalism where we could fit what we needed in the RV and what we wanted to hang onto for the future in storage. Cleaning out the drawers and closets I ignored for years wasn’t exactly fun. Throwing away things I truly didn’t need but hoarded for the memories wasn’t exactly easy. Getting rid of things I liked or will use one day wasn’t my favorite. The process of simplifying wasn’t really my favorite either. I probably got rid of 10 trash bags of just my clothes – ridiculous! Even when we were still in the house but the excess stuff was gone, I didn’t miss them. Getting ready in the morning was so much easier because I wasn’t shifting through things I never wore to find what I wanted. We forced ourselves into a minimalist lifestyle because we wanted to take this trip, not necessarily for the minimalist lifestyle but living without the clutter has been refreshing. We still have all the memories and room to make more. Simplifying your stuff takes time – at least it did for me. One category, or hey, one drawer at a time. Sort, throw out, sell, give away or organize. It may not be the most fun thing in the world, but it’s worth it!